Windows 8 comes with the option to pre-provision the disk for use with BitLocker, allowing only the used-space to be encrypted, thus reducing the encryption time a lot. Problem occur when enterprises want to use the Microsoft Bitlocker Administration and Monitoring (MBAM) toolkit from the Microsoft Desktop Optimization Pack (MDOP) to store BitLocker recovery keys, and track compliance. MBAM 2.0 sp1 does not support used-space encryption as per the release notes, forcing enterprises to either drop MBAM or perform full encryption of the disk, which can be a time consuming task depending on disk size and CPU performance. After spending quite some time investigating this, reading multiple blogs, articles etc. only to find other people with the same dilemma, and vague hints to how to overcome this, I managed to get this to work. MBAM Group policy’s has been created, forcing Bitlocker for the OS drive, and backing up TPM password to Active Directory. When deploying a new computer using the bare-metal task sequence, we want the OS disk to be pre-provisioned using used-space-only encryption, allowing for encryption as image is applied to disk. Once the Windows 8 image has been installed, we want MBAM to set protectors, and backing up the recovery keys to Active Directory. After trying several different methods for having MBAM back up the TPM Hash to the MBAM database , I would always end up with either missing the TPM hash or the TPM being in legacy mode. If MBAM is to backup the hash key, it has to be the owner of the TPM and this will force the TPM into legacy mode in Windows. This is not a scenario that I like due to possible 3.rd party security solutions relying on the TPM. As a result of this I opted for the solution where Windows takes ownership of the TPM, and the Hash key is backed up to Active Directory. Ok enough background information, lets look at the implementation I ended up with. First step is to pre-provision the disk. For this we can use the “Manage-bde –on” command. Next comes the part that was causing me all the headaches, we need to inject local policies into the target OS so these are in place at first boot. 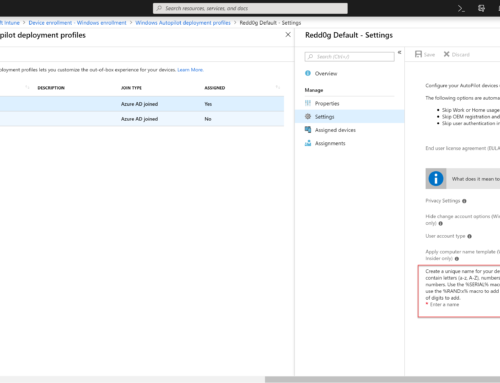 If these settings are not set, backup of the TPM to Active Directory will fail, and sometimes lead to TPM being left in legacy mode. 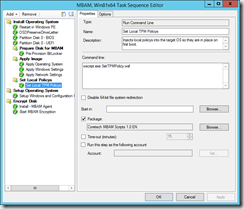 The SetTPMPolicy.wcf script contains a subset of the settings that are specified in the BitLocker and MBAM Group Policy’s´for forcing AD backup and encryption type. Once the operating system is installed, we need to install the MBAM agent and trigger it to apply protectors and backup the recovery keys. The installation of the agent is performed by an application that deploys the MBAMClient.msi located on the MDOP installation media. 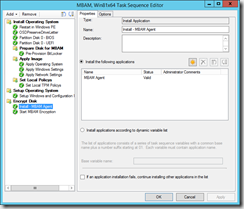 Finally, to trigger MBAM to apply protectors we execute a script that will stop the MBAM agent service and set local registry keys to specify MBAM endpoint, and disable the delayed startup, before starting the service again. 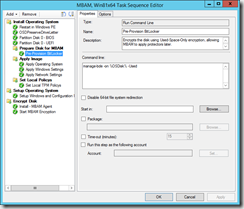 MBAM will now read its temporary settings from registry, and finalize the encryption and backup the recovery keys. The StartMBAMEncryption.wsf script that I use is inspired by the script originally made by David Hornbaker from the Deployment Guys, and later modified by alexsemi (found here: The Deployment Guys and here: AlexSemi’s Blog). One of the modifications that I have made, is to make the script wait for the encryption and backup to complete before exiting. I experienced several occasions where a reboot just after starting the encryption would cause the backup to fail. The scripts used in this task sequence is attached to this post, and can be downloaded and placed in a package along with the ZTIUtility.vbs script from the MDT 2013 toolkit. 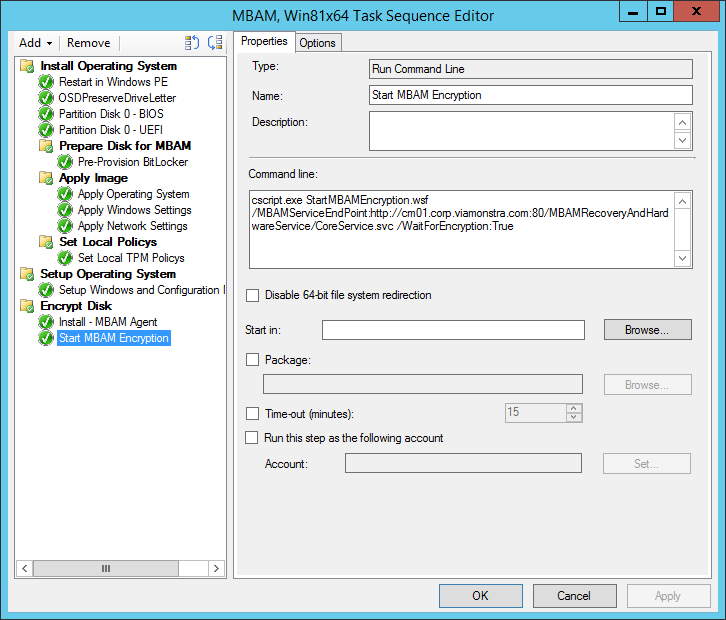 Although not supported by MBAM directly, it is possible to use MBAM along with Used-Space-Only encryption. 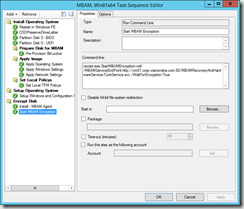 1) Can your method be modified to allow the backup of recovery keys to the MBAM database? 2) Will this work for Windows 7? 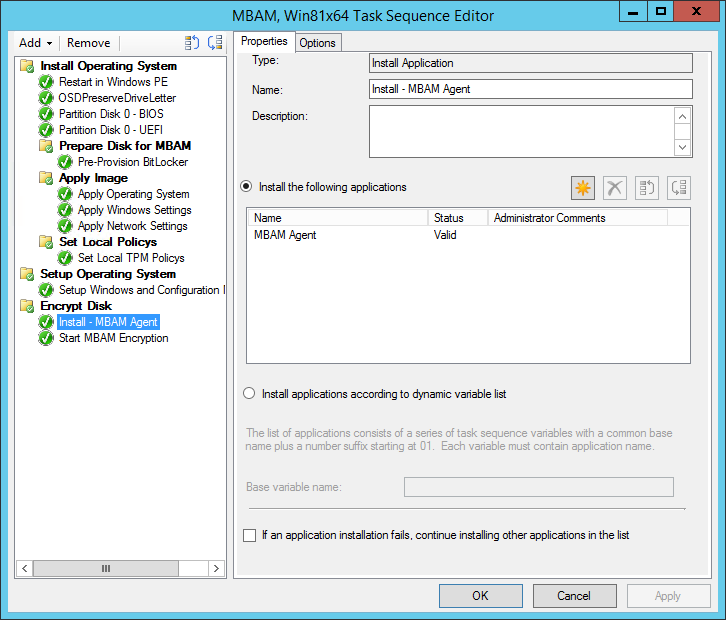 3) Our current infrastructure is ConfigMgr 2012 SP1, MBAM 2.0 (no service pack) and MDT 2012 Update 1. Would your method work in sure an environment? The method I use does perform a backup of the BitLocker recovery keys to the MBAM database, only the TPM hash is backed-up to Active Directory. Used-Space-only encryption is a new feature of BitLocker introduced in Windows 8, and therefore you can not use this feature in Windows 7. You will though be able to pre-provision BitLocker, and have MBAM perform backup of BitLocker recovery keys. This works well with SCCM 2012 and MBAM 2.0. You should be able to use the same task sequence steps, only modifying the manage-bde command skipping the -Used argument as it is not supported on Windows 7. I am going through the same pain but I have an additional issue. On our laptops we have both a C and D drive. I can get MBAM to save the C drive recovery key to the database but not D with pre-provisioning. It appears MBAM is only interested in TPM protected drivers which D cannot be. I am still trying out things to achieve this as we can get MBAM to save the D drive keys if we do a full encryption (yuck!). btw – We do pre-provisioning on Windows 7. 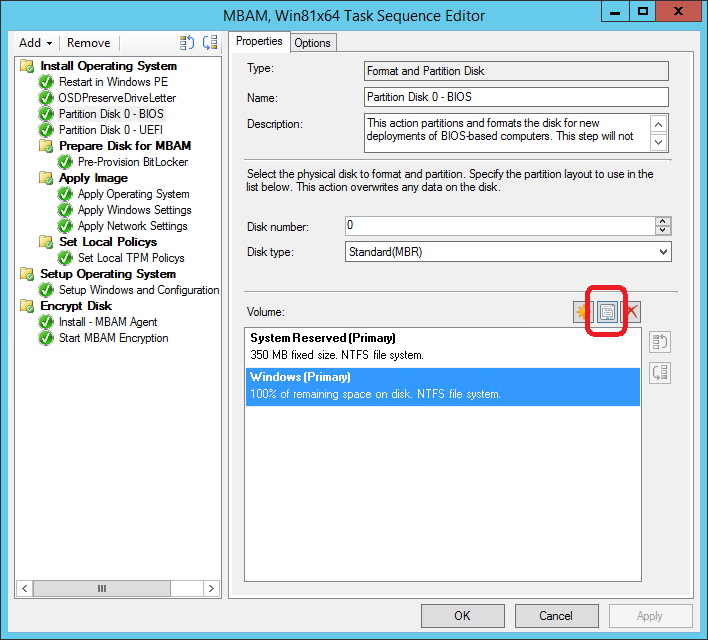 Whilst it is true that the “used” parameter is not supported on the Manage-Bde -on command within Windows 7, you can do this this within WINPE 4.0 or greater (as its Windows 8) in a task sequence that installs Windows 7. We do it! Nice to hear that I’m not the only one who has struggled getting this to work. The StartEncryption script needs to be modified though, as it is hardcoded to only handle the C: drive. If you pre-provision the drive, in the same way as the C: drive and modify the script to add protectors to the D drive I would believe that it should work. The for loop in line 202-213 is only for the C: drive as it sets the TPM protector, which can only be used on C: as you mention your self. I will try to get the time to create a new post with these changes in the near future. 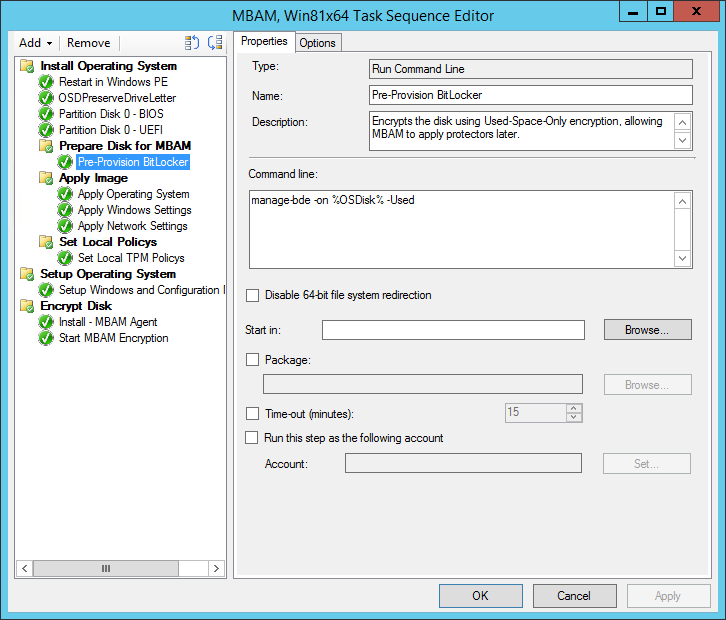 I followed exactly the same process for implementing MBAM bitlocker encryption on Windows 8.1 64 bit task sequence using SCCM 2012 R2. But I am getting error “The operating system reported error 2147942487: The parameter is incorrect.” in status message. Again for Set Local Policies step, it is not going past this error message at all in the status message. The operating system reported error 1: Incorrect function. but the same message is coming. MBAM agent is getting installed and the Start Encryption command line as suggested by you is also successful. At the end, C: drive is fully encrypted once the full task sequence was completed. can you please suggest, what i need to do to get past those error message. Sorry David, the questions was for Henrik. Hi Henrik, could you please respond to my queries above. -This could indicate that TPM settings in BIOS is invalid. have you tried to reset the TPM chip? 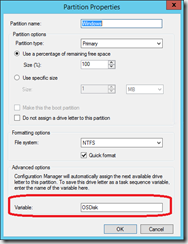 -Make sure that the %OSDisk% variable is assigned to the Windows partition in the format step. 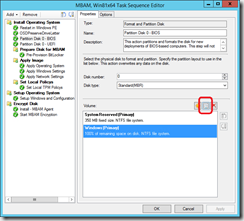 -Make sure your group policy for MBAM/Bitlocker allows for the use of TPM only. I keep getting “Failure (10005): 1: Loading Offline registry hive from : Windowssystem32configsoftware” when running SetTPMPolicy.wsf. I’ve also tried running the script manually from both Windows PE and Windows 8.1 with the same error. It seems that you are missing a drive reference, so the script can´t locate the hive. 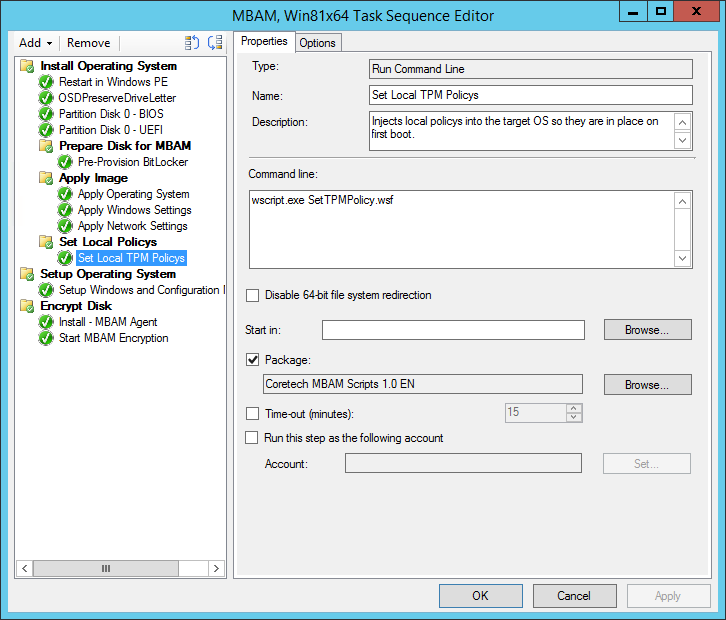 Make sure that you execute the script in the task sequence after image is applied, but before rebooting to Windows mini setup. 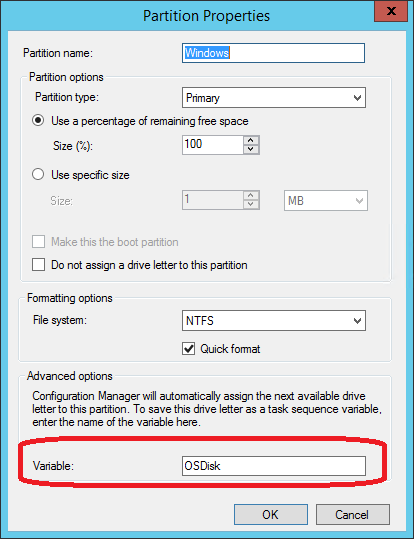 The Script relies on the task sequence variable OSDisk to resolve the drive with the applied image, so make sure this is set as well. do we have any option for start the Encryption for C and D drive at same time in MBAM 2.0? Reason is MBAM 2.0 client installed machine we need to wait until completing the C drive encryption to start D drive encryption. Greetings! The TPM script requires backing up to AD. With current MBAM solutions we don´t use AD recovery at all. Is there any way to create similar TPM script without AD recovery requirement? We do not modify AD at all for Bitlocker. Thank you for the great post. According to the following thread in the MBAM forum (https://social.technet.microsoft.com/Forums/en-US/6cbf51f8-76e9-4689-8541-c8c9e505689b/mbam-agent-key-escrow-issue-after-preprovisioning-bitlocker-in-sccm-ts?forum=mdopmbam), the MBAM agent will not automatically regenerate the recovery key if the manage-bde command is used to set TPM/Numerical Password key protectors. As I understand, the StartMBAMEncryption.wsf script also uses manage-bde command inside. Have you had the chance to verify if the MBAM agent regenerates the recovery key for the system that has been encrypted using the StartMBAMEncryption.wsf script? Personally, I do not think this is critical if the original recovery key is retained in the MBAM database although the static key is less secure than dynamic key that MBAM should regenerate.